← The Thinking Housewife: In the wake of Sandy, why are New Yorkers dressed so drably? 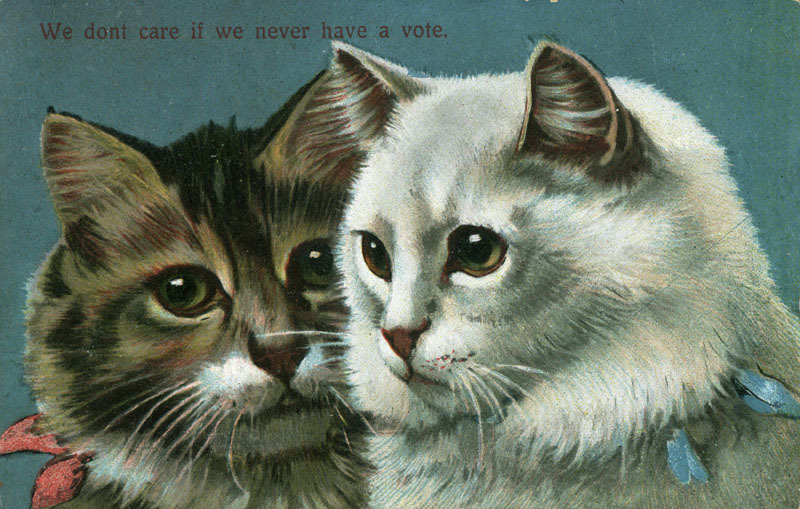 Pretty kitties, like pretty ladies, don’t want the vote. 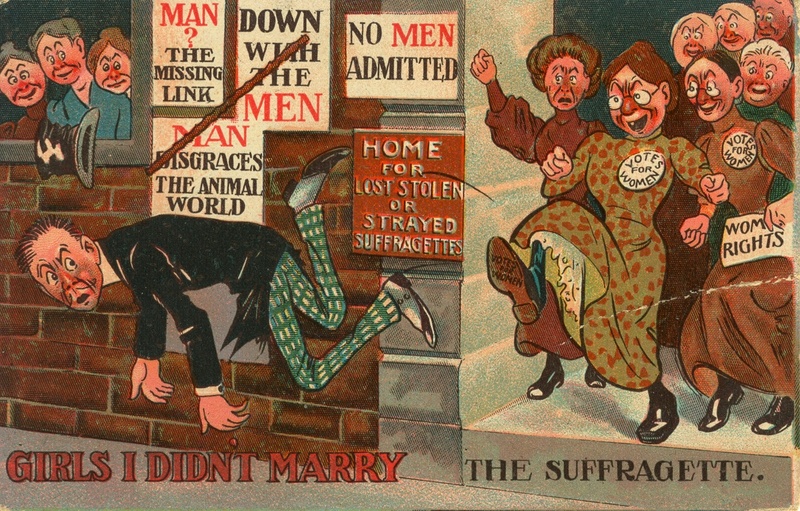 There’s an interesting piece over on Collectors Weekly about those anti-Suffragette postcards I sometimes use to illustrate my posts here. (Thanks to Jezebel for the link; I’m not exactly a regular reader of Collectors Weekly.) 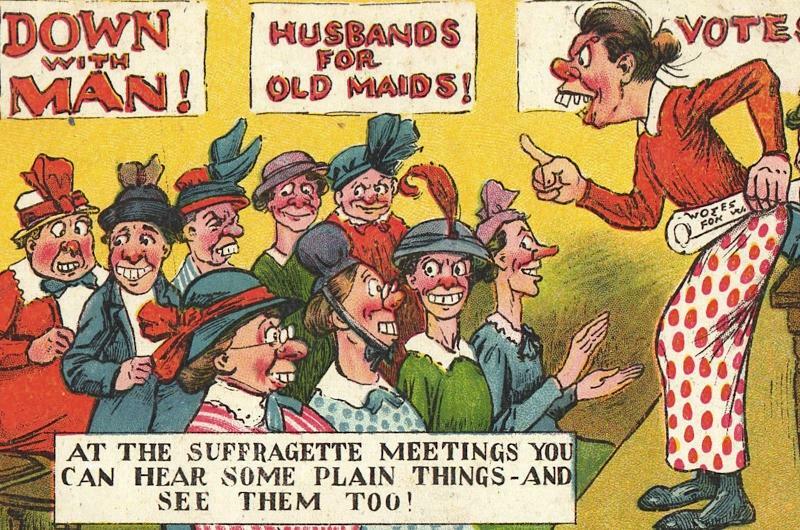 Lisa Hix puts the cards in context, offering a sort of mini-history of the suffragette movement in the process, and notes that the cards present some of the often contradictory “arguments” still used against feminism today. That all sounds a bit familiar, huh? 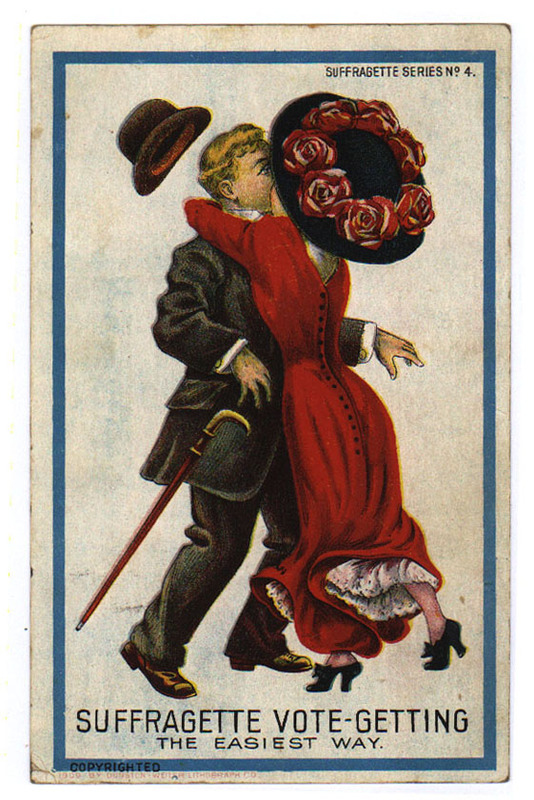 Manosphere dudes are similarly fond of depicting feminists, and women in general, as flighty, irresponsible children. And this giant gallery assembled by the misogynistic antifeminist who calls himself Patriactionary. Thanks, Mr. Patriactionary, for reminding us how completely backwards you guys are. Not that we really needed reminding. Thus far Reasoning with Seasoning has, like all of Meller’s ideas, been a complete failure but excellent fuel for mockery. I haven’t tried to Vosges, but I know where to get it is, so I will! Also, Mexican hot chocolate is awesome. Well that was some epic grammar fail. See, this is what happens when you read too many MRA rants – it’s infectious. Wow Cassandra, I’ve never met anyone who wasn’t Tibetan who likes བོད་ཇ་ (bod ja). Maybe it tastes better with cow butter that isn’t rancid? But if it isn’t semi-rancid yak butter, is it really Tibetan tea? Mr C loves it too, and he’s not Tibetan either. Though we both agree that it’s a bit filling to drink with food – it helps to think of it more like a soup in terms of meal planning. The place where I usually get it does list yak butter on the menu (though I have no idea where they’d get that), and it doesn’t taste rancid to me, just creamy and buttery and salty. Strangely enough, even when you consider Meller’s analogy the way he intended, it ends up making our point for us. Suppose we lived in a world where salt and sugar were the only right kinds of seasoning. People might tolerate some variations, perhaps powdered sugar or sea salt, but for the most part, you used either plain white sugar or plain white salt. No cinnamon, none of the pepper varieties, no oregano, nutmeg, allspice, parsley, ginger, paprika, rosemary, thyme, or garlic, to name just a few. Would anybody really want to live in such a world? Meller would. This is because he’s very boring. That sounds good too! There’s not much I’m not willing to try in terms of tea. For those who like their tea strong, but sweet and milky, this also looks quite appealing. I might get some for my Gran. His conclusion just plain doesn’t follow. He’s saying “don’t experiment because the results might be bad.” But that implies that if the results weren’t bad, you should go for it! And how can you threaten people with bad results for things they’re already doing? He gives no reason you shouldn’t stick with it if you like how things are going for you, and no reason you shouldn’t experiment if you don’t like your current situation. And now feminists have taken to “liberating” cooking. Ladies, when I suggested that you would do a lot better cherishing your culinary, baking, and gourmet skills, I certainly didn’t mean that you should display complete dementia! 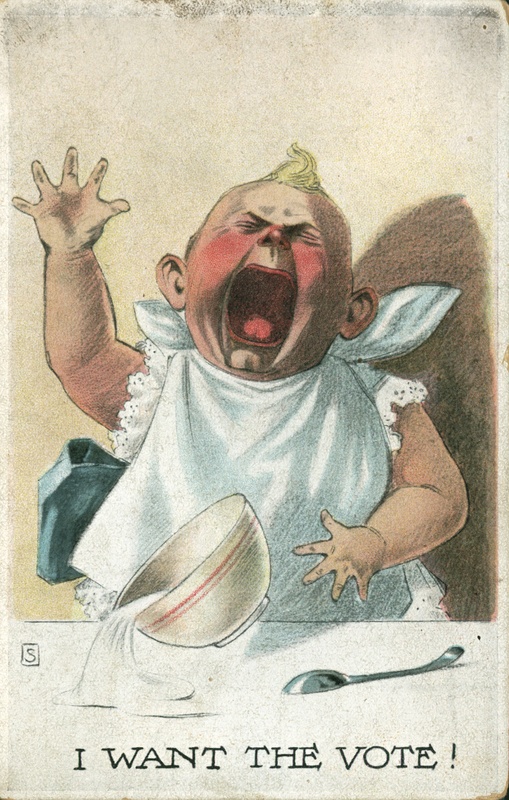 Psychotic behavior isn’t good in the kitchen, least of all not with all of those sharp instruments! Salted caramel is heresy! Heresy, I tell you! None of my Madame Alexander dolls would ever think of making such a thing! LOL! We’re allowed to cherish our culinary skills, but heaven forbid we actually try to be creative or have fun with it. That’s Satan’s cooking. Nope, all we need are the recipes for the meals that hubby’s mom always made, and we must cook them exactly the way he likes it. Oh, and don’t even think about getting him to do any of the cooking or washing. Why, that would make you a lazy, hateful, disgusting slob, and force him to start sleeping with the secretary. Yes, Martha Stewart is definitely Meller’s kind of gal. She has a degree from an Ivy League school, worked on Wall Street, and founded a media empire which has made her wealthy to the tune of $970 million. You need to read the comments on that cake because the bottom one is priceless. “This cake hurt our feelings”! Oh, that is a good one 🙂 What a mean cake. A feminist would serve up such an insulting sweet! Meller, if I told you a male chef introduced me to the peanut butter and sriracha thing, would it make you feel better? Or would that just be proof of gender roles gone haywire? So like all museums, the one where I worked had a super swank little cafe, and they had a cake called the Elvis cake. It had banana, peanut butter, and bacon. I see good quality bars of dark chocolate with sea salt or chilli in them all over the place these days. Katz, was the bacon on top, or incorporated into the cake?